I presented at Ignite Portland #7, November 19, 2009. Although I enjoy speaking, and have spoken before large crowds often, I found speaking at this event strangely difficult and then surprisingly rewarding. Both the format and subject matter were new to me. Presenting at Ignite is more like a poetry reading than a lecture. I did not know when I had practiced enough. 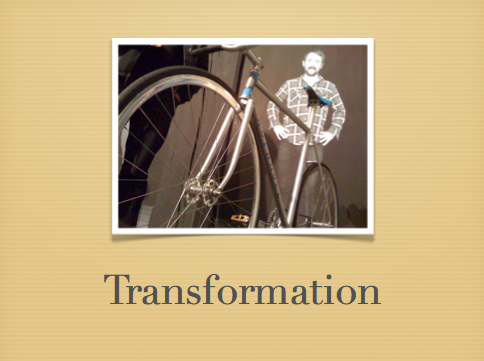 My subject, a personal transformation, seemed small considering what I knew the average Portlander has done themselves. I got through it by relaxing and reminding myself that I was really honoring all the people who had inspired me along the way. My car was stolen last January. The last thing I wanted to deal with was replacing the car. I chose to do without. My car was recovered five months later. Having it show up again was a bit of a nuisance as I am now bike-oriented. I have been and now am again be bike-oriented. My best experience has been to have my bike "disappear" as I became one with the road I traveled. That is, my bike became an extension of myself, not a vehicle I operated. Modern bicycles are wonderful machines. Everyone should have four or five. I will describe how a chubby old guy can find a new relationship with time, temperature, mind, body, traffic and the law thanks to his wheels and pedals. Ignite Proposal. Submitted with only vague outline in mind. Event Video. Twenty slides in five minutes. Presentation. With text of intended, but not actual, commentary.